In a separate bowl, put evaporated milk and Kahlua, and again, with the Kahlua, it’s a matter of taste. Add seasonings and stir all together. Mix flour and cracker crumbs together with a little more of your seasonings to make a dredge (I sometimes use cornmeal too). 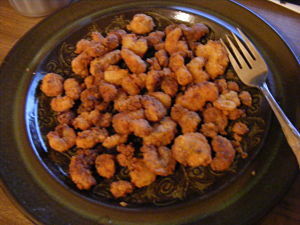 Soak shrimp in milk mixture then dredge in flour mixture until well coated. Drop in hot grease and fry until golden brown. It doesn’t take shrimp long to fry, so don’t over cook them or they will be tough and rubbery. After my shrimp are finished, I like to sprinkle just a tad bit of Cajun seasoning on the top for extra flavor.